^ a b “Governor Pataki and Mayor Bloomberg Announce Closing of Multi-Billion Dollar Agreement to Extend Airport Leases” (プレスリリース), Port Authority of New York and New Jersey, (2004年11月30日), http://www.panynj.gov/AboutthePortAuthority/PressCenter/PressReleases/PressRelease/index.php?id=607 2007年8月8日閲覧, "The Port Authority has operated JFK and LaGuardia for more than 55 years. 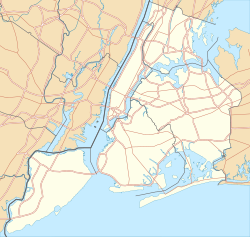 The original 50-year lease [with the City of New York] was signed in 1947 and extended to 2015 under an agreement struck in 1965." ^ Aviation Department (2014年12月) (PDF). ﻿Traffic Report﻿ (Report). ニューヨーク・ニュージャージー港湾公社. http://www.panynj.gov/airports/pdf-traffic/DEC2014_JFK.pdf 2015年8月30日閲覧。.